Have you been sulking since the final episode of Boardwalk Empire? Here's good news: The Prohibition-era legacy is alive and well, supplying and inspiring craft beer brewers, wine lovers and cigar aficionados in Plymouth, Mass. In 1933, Anthony "Tony" Pioppi and Budweiser distributor Louis Knife rode Clydesdale horses through downtown Plymouth to announce the repeal of Prohibition. Pioppi's Package Store received the first liquor license in town and the start of a thriving, three-generation family business was born. 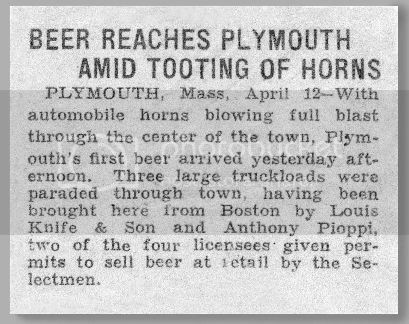 Newspaper clipping about the new liquor licenses in Plymouth, following Prohibition. Tony's grandson Peter Balboni, Pioppi's current owner and manager, explained how the store got its name: "The term 'package' derives from the fact that following the repeal of Prohibition, a political compromise was reached with the leaders of the temperance movement whereby containers of alcoholic beverages could not legally be carried in public uncovered from view." 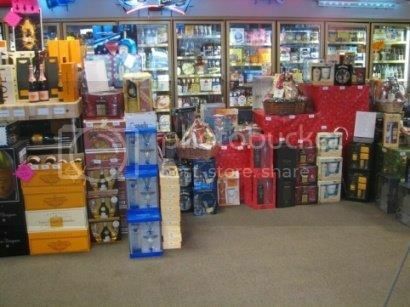 So stores that sold alcohol had to wrap or "package" their customers' purchases to keep the contents out of sight. Six-year-old Balboni helped out at the store, rotating candy and gum packs to keep the product fresh. His payment was a pack of Juicy Fruit gum, which cost 10 cents back then. He fondly remembers getting rides around the store on the hand truck from his father and older brother. Inside of the modern-day Pioppi's Package Store in Plymouth, Mass. Balboni's official retail career started in 1991, after graduating from business school and working as a marine manager. "I had no plans on going into the liquor industry, but they passed the luxury tax and the bottom fell out of the boating industry," said Balboni. "While helping my father at the store and looking for a job, I soon saw an opportunity to bring the business to the next level." For Pioppi's customers, the next level means an expanded 10,000-square foot sales floor with over 700 wines, 150 beers, a vast liquor selection, TV commercials, fun events and a new bartending service for corporate and private events -- all things that have undoubtedly contributed to winning best liquor store in Plymouth eight years in a row and Massachusetts Beverage Business 2009 Retailer of the Year. 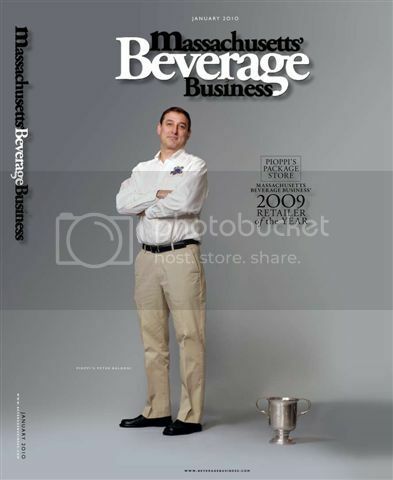 Peter Balboni on the cover of Massachusetts Beverage Business Magazine. One of the store's most popular winter events is Sunday School, a 2-hour onsite wine seminar where Pioppi's partners with local restaurants to offer a tasting menu and wine sampling with an expert wine maker or brand ambassador. In the summer, the sampling and tasting menus continue with a 3-hour Pioppi's Sunset Wine Cruise aboard a local tour boat. The next big event is a bourbon dinner and 4-course tasting menu on January 15, 2015. 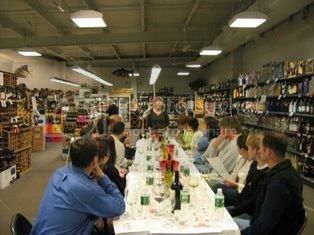 One of Pioppi's popular wine tasting events. When asked what makes Pioppi's stand out, Balboni said, "A combination of staffing, selection, being innovative and community involvement." The Plymouth native is involved in local organizations, serves on the executive boards of the Pilgrim Society and Plymouth 400 committee, and consistently supports area charities and causes. "If I had to say just one thing that I enjoy most about being a business owner in Plymouth, it would be the pride of being in business for three generations, 80+ years and having personal relations with so many great people who live here and the surrounding towns."